Our town is an unusual one, sporting more-than-its-share of contradictions and oddball behavior— that is widely known. And one such quirk is that, while on the one hand we support a colossal percentage of vegetarian, non-dairy, all-organic glutards, we simultaneously have a relenteless appetite for things that (arguably) aren’t so…ummm…health conscious. 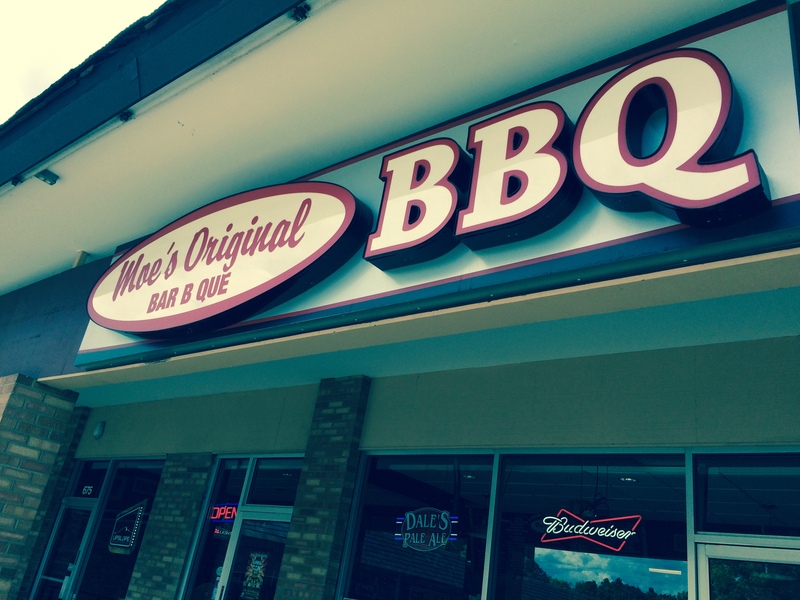 With that in mind, we went to Moe’s BBQ (675 30th Street, by Carelli’s), a purveyor of smoked carcasses and rich, traditional side dishes. 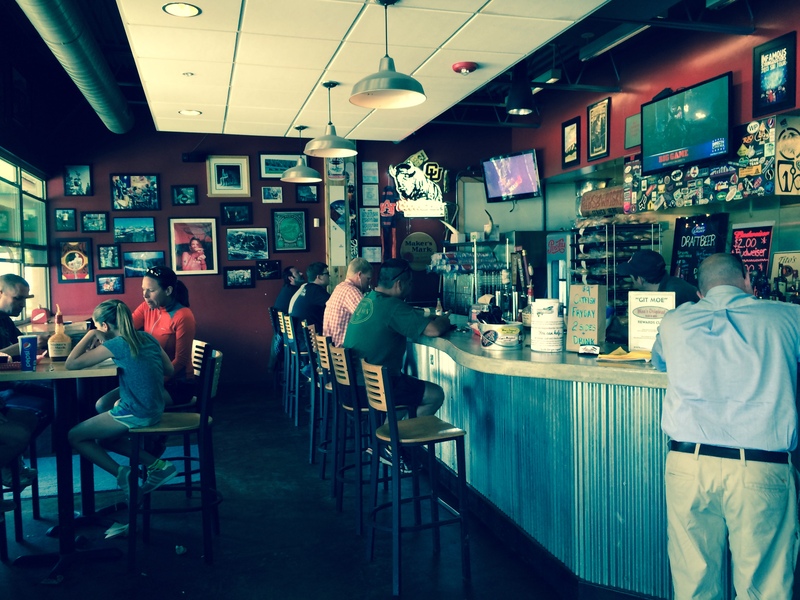 Moe’s is a growing chain that keeps things relatively simple; the décor is dark, loud and somewhat retro, but unpretentious and homey. The meats are served on paper and arranged however they fall off the knife, they are not adorned with crushed truffle and Bavarian mint remoulade nor showcased with whimsical towers of baby radish sprouts. It’s just flesh, smoked and slathered, then cut medium thick. We ordered a “3 Meat Combo” platter ($14) and chose baked beans as well as red beans and rice for the sides. Our meat selections were pulled pork, brisket and smoked turkey. All were good, if not Flinstone-sized, portions. The pulled pork was soft, somewhat sweet and and very smoky. The turkey was servicable, but had a tough job standing up to the bold flavors of the four-legged food. But let us now speak of cow; brisket is enjoying a huge resurgence as bbq joints spread north from Texas, and in all directions from Kansas City. The price is skyrocketing as demand outpaces supply, but it’s an irresistable hunk of moo muscle with no adequate substitute. Moe’s does a good job of capturing the beefy, campfire flavor and satisfying mouth feel, though more than one taster thought it was on the dry side. Brisket is a tough cut of meat, hence the low and slow cooking method, and though I agreed that it seemed dry initially, the chewy comfort made it the clear winner for me. The beany side dishes handled their support job well; tasty without detracting from the meaty stars of the show. Moe’s is an easy place to recommend if you have very specific hankerings of the carniverous kind. Need a kale frappe or pine-needle hummus? Keep movin’, nothing to see here. 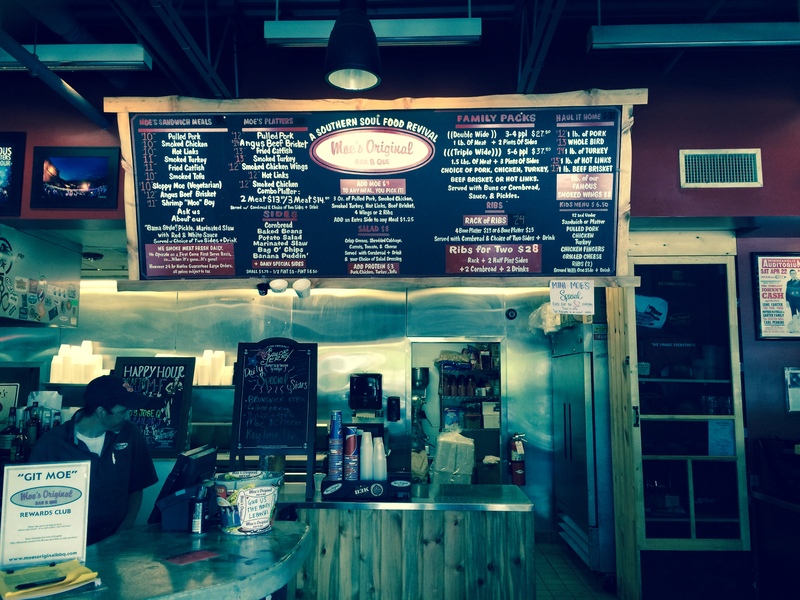 But for moderately priced, very good if not perfect cuts of beef, pork and fowl are what you seek, Moe’s is a fine choice.